Clay on ET. Special correspondent. @RyanHoulihan: "Entertainment Tonight has Clay Aiken as their Political Correspondent." - @christinagausas when asked about tonight's debate. @TheAgeHacker: Clay Aiken is ET's 'Political Contributor'??? 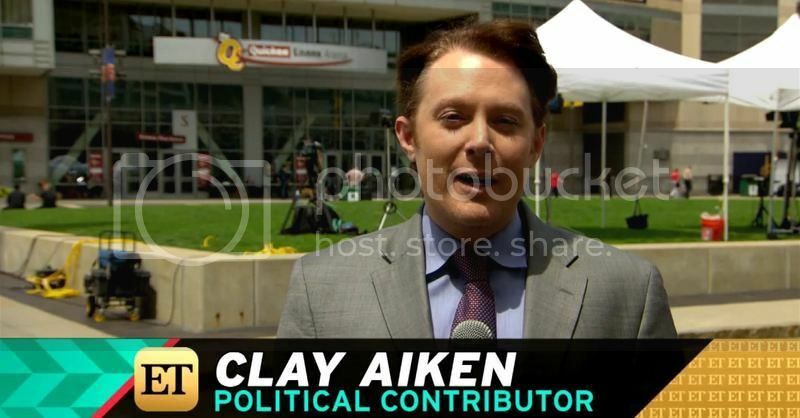 @mikesisak: American Idol (and U.S. House) runner up Clay Aiken is Entertainment Tonight's political correspondent. So much going on in that sentence. To quote a song: "This could be the start of something big"
OMG I love him, he did good and he's back tomorrow. Just saw it -- and he looked and sounded great! They also said he'd be on again tomorrow with debate wrap up. Grey suit, red tie and poofy hair......so Clay! I'm seeing complaints about the hair, as per usual. Sigh. I think he looks great! @clayaiken: Fox anchors being nice and starting each candidate off with the question they were most prepared for! @clayaiken: Is it true and unbiased journalistic integrity to describe someone as "an illegal" ? Lots going on. thanks for all the updates. I'll have to watch idol the night he's on. Clay was just on ET again. Short and sweet. Same outfit as last night. Video will appear soon I'm sure. I still think this is a great niche for him. Short, yes, but he still comes off as knowledgeable. I love that. HAPPY BIRTHDAY PARKER FOSTER AIKEN! trying to stay impartial as a reporter should be. I hope if he was trying out for a news position, he gets it. My how time flies, seven already. Watch out Clay. He'll be a teen before you know it. Someone's going to be happy. Clay retweeted this! Clay was just on Periscope! Lots of foil in his hair. Jamie was with him, coloring his hair. Said he's going to be doing more Idol auditions this Saturday! He pulled an eyebrow hair out because it was grey. I think Parker was there. Another quick Periscope -- going to try Facebook video soon on his verified account. Why would he say don't forget about Vegas? I don't know -- what is happening in Vegas? I just rewatched the clip, and I'm thinking it was someone asking him about Vegas in the comments? Did you grow up watching American Idol thinking "that could be me one day?" NOW IS YOUR CHANCE - right here in LA - and for American Idol's farewell season. American Idol and bBooth, The Talent Discovery Company, have partnered to bring the opportunity to audition for American Idol Season XV in Los Angeles. Show off your talent on Saturday, August 15th, 10:30 am - 6:00 pm at bBooth. Registration begins at 10:30 am and will be located on level 4 pf parking deck (Dining Terrace Entrance) at The Westfield Culver City Mall, 6000 Sepulveda Blvd, Culver City, CA. Previous Idol winners and finalists are scheduled to make guest appearances as well. Clay was driving, heading into what looked to be a nasty storm.